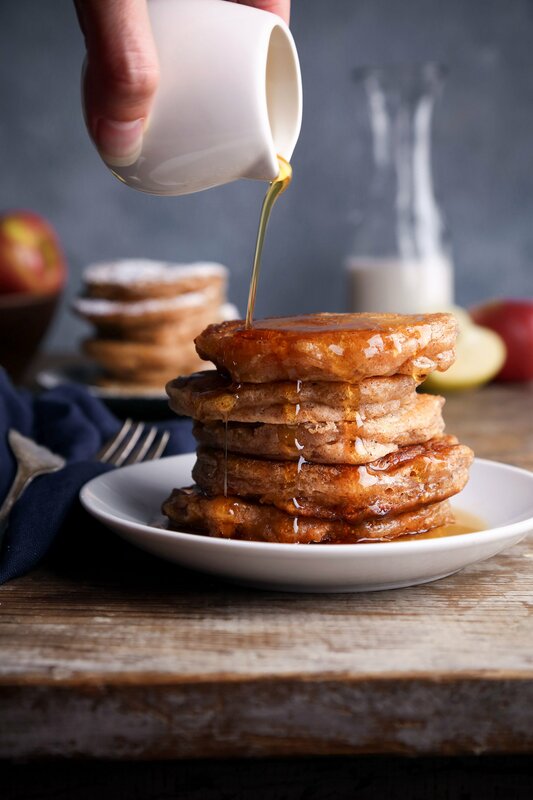 Combine breakfast & dessert with these apple fritter pancakes! Juicy apples and the warm flavor of cinnamon are abundant in this delicious breakfast treat! In a large bowl, combine dry ingredients: flour, baking powder, cinnamon, and salt. Add milk, maple syrup, and melted coconut oil and stir just until combined. Gently fold in chopped apples. Batter should be thick (like in the photo above) but if it is too thick to stir, just add a splash more milk. Place a large non-stick pan over medium heat and add enough oil to lightly coat the bottom of the pan. When oil is melted and pan is hot, pour batter by the ¼ cupfuls into the pan. If necessary, use your spatula or a spoon to gently spread dough into a round pancake, so it cooks evenly. Cook about 1-2 minutes per side. Turn down the heat if pancakes are browning too fast or not cooking in the middle. Remove when lightly browned and center is cooked. Continue to cook in batches until all the batter is used up, adding more oil to the pan when needed.